The Charvel Pro Mod San Dimas Style 2 HH FR Electric Guitar in Natural Ash honours the heart of what Charvel guitars are all about. The laid-back style belies an uncompromising high-performance feel, which is fantastic for those who like to play with speed and precision. If you're looking for a guitar that travels well, plays sweetly, and sounds fantastic, then the San Dimas is the model for you. 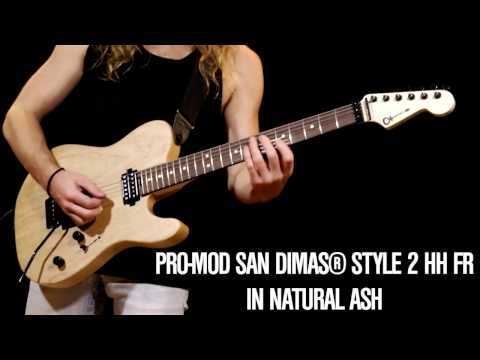 The Pro Mod San Dimas Style 2 model is built using ash, which is a light and highly resonant tonewood that produces a versatile tonality. Offer firm low-end power, a subtle midrange, and a lengthy sustain, ash is a generous wood that is perfect for a hard rocking axe. As we've come to expect from Charvel, the body is ergonomically designed to put comfort at the fore. With sweet contours and curves in all the right places, the body rests snugly as you play to ensure that you can sail through any performance effortlessly. The natural finish of the ash shines through to give a distinctive, stripped-back aesthetic. Charvel appreciate that their guitars are not destined to simply reside in a bedroom, instead they are likely to see the world. With that in mind, they also understand that changes in temperature and humidity can have a devastating effect on necks. With this in mind, the two-piece bolt-on maple neck is giving substantial reinforcement using graphite rods to prevent unwanted warping or twisting. The neck is shaped to Charvel's speed neck profile and treated to a hand-rubbed urethane gel finish to allow your fretting hand to glide along with ease. Paired with the neck is a sublime dark rosewood fingerboard, which has been given a compound radius that takes it from 12-inches at the nut to 16-inches at the heel, giving you the chance to whizz along at lightning speeds without minimal effort. Thanks to the deep cutaway body profile, your fretting hand can reach the upper frets without any obstacles, whilst black dot position inlays guide your way. The Charvel San Dimas Ash is home to a pair of Seymour Duncan humbuckers, with a JB TB-4 in the bridge that offers a high-output powerhouse for chugging riffs and wailing leads, and a '59 SH-1N in the neck for a fat, warm output that sings brilliantly. The versatile tonal palette of the ash body is translated exquisitely by these pickups to make certain that whatever you turn your hands to, epic tones are never hard to find. The volume control is equipped with a pull/pull coil split to open even more tonal variations, whilst the no-load tone control allows you to cut the tone completely so that your guitar's natural tone can shine through unblemished. The San Dimas body is equipped with a Floyd Rose double locking tremolo bridge, which allows you to dive and wail with wild abandon. The Floyd Rose locking nut works with the Charvel die-cast tuners to guarantee that once you lock in your tuning, it remains steadfast no matter how hard you rock out. Everything you need to tear it up on the stage is ready and waiting, all that is needed is you!